About this object Joseph Byrns served the state of Tennessee for fourteen terms in the House of Representatives. 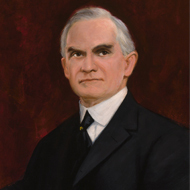 His son, Joseph Byrns Jr., later served a single term in the 76th Congress. Brush up on House history with a series of fact sheets on Speakers, the House Rostrum, Official Records, House Committees, and other related topics.